Attributed to lower costs of living, the population of Texas Triangle cities Dallas-Fort Worth, Houston, Austin and San Antonio increased from 12,838,417 in 2000 to 18,144,678 in 2015, according to data from the Federal Reserve Bank of St. Louis. 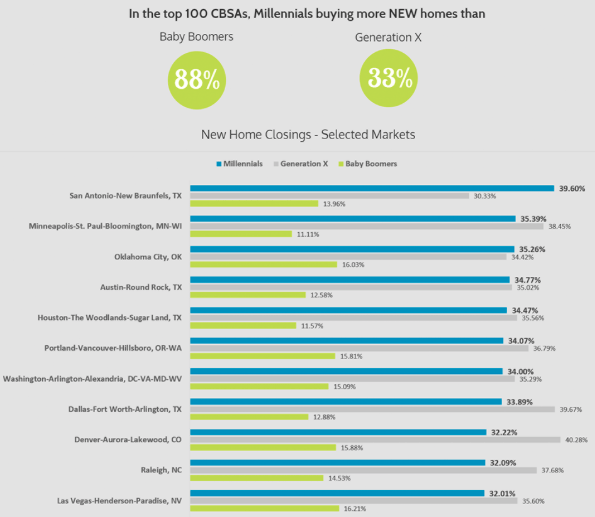 The Austin-Round Rock, Houston-The Woodlands-Sugar Land and Dallas-Fort Worth-Arlington metros all ranked within the top eight metros where millennials comprise a large percentage of homebuyers, according to new research from Metrostudy. With high income and employment growth and a short breakeven horizon — the time it takes for buying to become more affordable than renting — San Antonio is the “sweet spot” for homeownership, according to a recent Zillow report.